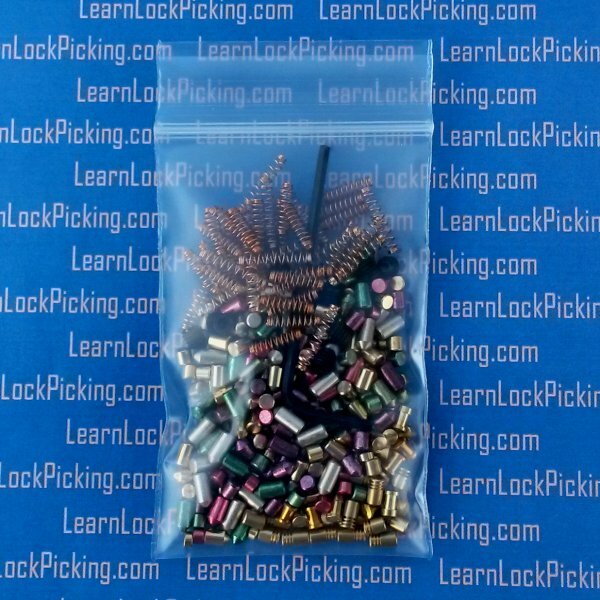 Bag of more than 100 assorted pins including bottom pins, top pins, master pins, replacement springs, replacement retainer screws, and a replacement Allen wrench for the retainer screws. 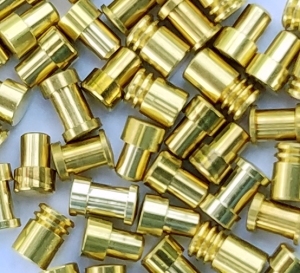 Also includes high security serrated top pins, spool top pins, and T-pins. This is the same assortment of pins that ships with our 7-pin Ultimate Adversary Lock. SKU: UpgradeKit. Categories: Locksmith's Tools, Practice Locks. Brands: LearnLockPicking. 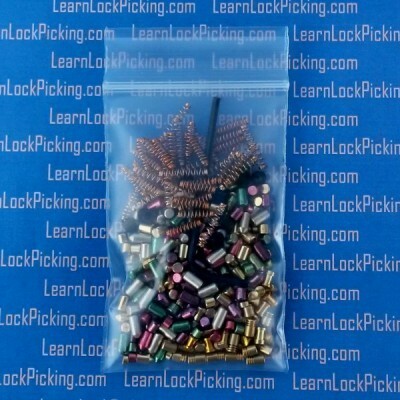 If you already one of our Ultimate Practice Locks and would like to order an assortment of pins that includes high security spool, serrated, and T-pins, this upgrade kit is what you need. Bag of more than 100 assorted top, bottom, and master pins. 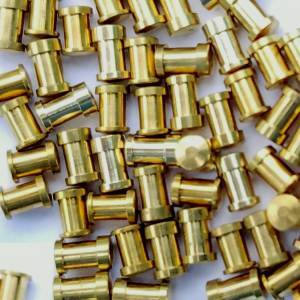 Includes high security serrated top pins, spool top pins, T-pins. In addition to lock pins there are also springs, replacement retainer screws, and a replacement Allen wrench for the retainer screws. There will be more than enough of the spool, serrated, and T- pins for at least one in each pin stack of our 7 pin Ultimate Adversary Lock. This is the same pin assortment that is included with the Ultimate Adversary 7-pin Lock. The assortment of pins, springs, and retainer screws is random and varies but always includes everything listed above. Lots of pins in it, of all sorts. pretty good value for practice or if you want to secure some locks you own. Great assortment of pins and springs! great assortment of springs and pins. buying again soon! Don’t think about it just buy it. Best value pin set I’ve seen anywhere. This will save you loads of money on practice locks. It is what it days on the packet. I’m sure it will vary from bag to bag, but mine came with a nice variety of standard pins of various sizes, plenty of springs, 17 set screws, 1 allen wrench, 40 spools, and 39 serrated. I’m very happy with it. It’s great with the practice locks, and you can also use them to repin other locks you own. FYI – it’s a random assortment. We do tend to add more than we promise but I want to keep expectations under control. Don’t want anyone to feel they got ripped if if they get a different assortment than this one. But…gland you’re happy with your purchase. We like happy customers! A must upgrade from the standard kit. You can make your own challenge lock with these pins as you advance beyond the standard kit. Would definitely purchase again. This was just what I needed. I made my own challenge lock instead if buying one from this website, but these pins were still a perfect fit. It allows me to make my lock as difficult or as easy as I want and the price can’t be beat. Excellent value. Expands the range of locks from dozens to hundreds with of variations with just a few minutes work. Love the wide range of pins included. Can’t say enough good things about it. I bought this to go with the 7 pin Ultimate Adversary Practice Lock. And with this assortment I have the option to load any option I desire and still have lots of pins left over to re-pin other locks. Great assortment pf pins and springs. Also includes the Allen wrench and extra cap screws in case you lose some! Was just filled with assorted driver pins, key pins, and springs, as well as the 6-32 set screws and an allen driver. Was delivered very quickly. Definitely a good investment for an intermediate or beginner picker seeking to start tackling serrateds and spools.